Managerial Mid-Back Chair Features A Breathable Mesh Back Chair And Fabric-Upholstered Seat. Mesh Upholstery Is Made Of High-Strength Elastic Nylon. Ergonomically Designed Mid-Back Matches The Natural Curvature Of A Person'S Back. Arms Adjust In Height (25" To 28-7/10") And In Width (24" To 26"). Functions Include Pneumatic Seat-Height Adjustment (17-7/10" To 21" High From The Floor), 360-Degree Swivel And Swivel Tilt Mechanism. Black Frame Has Five-Star, Reinforced Nylon Base (25" Diameter) With Casters For Easy Mobility. Seat Size Is 20" Wide X 18-7/10" Depth. Back Measures 20" Wide (At The Widest Portion) X 19-7/10" High. Weight Capacity Is 250 Lb. Chair Meets The Ca117 Fire-Retardant Standard.. 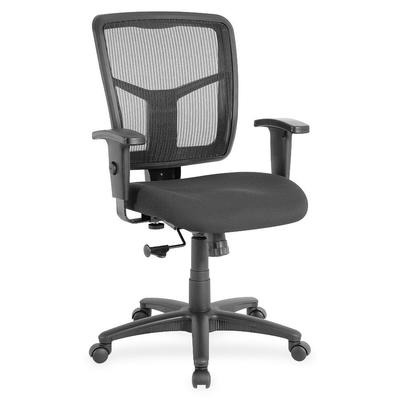 Managerial Mid-Back Chair Features A Breathable Mesh Back Chair And Fabric-Upholstered Seat. Mesh Upholstery Is Made Of High-Strength Elastic Nylon. Ergonomically Designed Mid-Back Matches The Natural Curvature Of A Person'S Back. Arms Adjust In Height (25" To 28-7/10") And In Width (24" To 26"). Functions Include Pneumatic Seat-Height Adjustment (17-7/10" To 21" High From The Floor), 360-Degree Swivel And Swivel Tilt Mechanism. Black Frame Has Five-Star, Reinforced Nylon Base (25" Diameter) With Casters For Easy Mobility. Seat Size Is 20" Wide X 18-7/10" Depth. Back Measures 20" Wide (At The Widest Portion) X 19-7/10" High. Weight Capacity Is 250 Lb. Chair Meets The Ca117 Fire-Retardant Standard.